creating substantial number of employment and warming up business environment in Odisha. 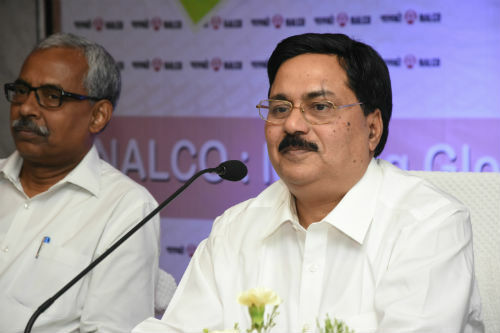 While congratulating NALCO Collective for the stellar performance, Dr. Chand also informed about the new projects in pipeline and the company’s growth plans. HighlightsProduction:• NALCO has been rated as the lowest cost producer of alumina in the World consecutively for the 2 years i.e. 2016 & 2017 as per report of Wood Mackenzie.• Panchpatmali Bauxite mines of NALCO rated as the 2nd lowest cost producer in the World in 2017 as per report of Wood Mackenzie; aiming to become the lowest in FY 2018-19. • Bauxite Mines (North-Central block of Panchpatmali Mines) achieved 100% capacity utilization with transportation (production) of 68.25 lakh MT for second successive year. Bauxite transportation (production) from new mine i.e. South block of Panchpatmali Mines started in 4th quarter of FY 2017-18. Transportation from South block is 2 lakh MT and combined transportation of both the Mines is 70.25 lakh MT, highest ever since inception. • Alumina Refinery achieved 100% normative capacity (i.e. 21 lakh MT) in successive years with production of 21.06 Lakh MT Alumina Hydrate. 5th Turbo Generator of Steam Generation Plant commissioned.• Aluminium Smelter production consistently increasing over the last 5 years and achieved highest cast metal production of 4.26 lakh MT (in last 5 years), registering a growth of 9.8 % over last year.• CPP achieved ‘Net Power Generation’ of 6,547 MU, registering a growth of 7.9 % over previous year.• Wind Power: 4 wind power units at different location of the Country generated 252 MU against 206 MU last year, registering a growth of 22 %.• Five Star Rating for Panchpatmali Bauxite Mines by Ministry of Mines for 2nd consecutive year.• SCOPE Award of Excellence in Institutional category (Navratna/ Maharatna) & SCOPE Meritorious Award for CSR from Hon’ble President of India.• National Energy Conservation Award in Aluminium Sector for the year 2017 from Bureau of Energy Efficiency (BEE). Financial:• In FY 2017-18, NALCO achieved highest net profit in last 10 years of Rs. 1342crore against Rs. 669 crore in previous year. • Third highest Net Foreign Exchange Earning CPSE in the Country.• The Net sales turnover for the year is Rs. 9,377 crore (highest ever since inception) registering a growth of 26 % over last year. Export earning of Rs. 4,076 crore also highest ever since inception registering a growth of 12 % over last year. • For 2017-18 an interim dividend of 94% amounting to Rs. 908 crore paid, out of which Rs. 547 crore paid to Govt. of India. This is the highest ever dividend declared by the Company.• Contribution to Public exchequers: Till FY 2016-17, Rs. 27,468 crore towards taxes, duties, royalties, dividend etc. out of which Rs. 21,552 crore paid to Central Govt. and Rs. 5,916 crore paid to State Govt. • CAPEX: Continuous increase in CAPEX expenditure in last 3 years. In FY 2017-18 there is 23.5% increase in CAPEX over last year.Growth Plan :Projects under Execution:• 1 MTPA capacity 5th Stream Alumina Refinery brownfield project at existing Alumina Refinery at Damanjodi Estimated project cost: Rs. 5,540 cr, Expected Completion: April, 2021• Development of Pottangi bauxite mines at Koraput, Odisha. Project cost included in 5th stream Refinery, Expected Completion: April,2022• Development of Utkal D&E coal mines at Angul, Odisha. Estimated project cost: Rs. 534 cr, Expected Completion: Utkal-D: FY 2019-20, Utkal-E: FY 2022-23• Upstream Integration: 2.7 Lakh TPA Caustic soda plant in JV with Gujarat Alkalies& Chemicals Limited (GACL) at Dahej, Gujarat. Estimated project cost: Rs. 1,999 cr, Expected Completion: 2020• Downstream Integration: Angul Aluminium Park in JV with IDCO at Angul, Odisha to promote downstream & ancillary industries. Estimated project cost: Rs. 100 cr, Expected Starting: FY 2019-20• 60,000 MTPA capacity Alloy wire rod plant at its Smelter in Angul to produce more value added products. Estimated project cost: Rs. 131 cr, Expected Completion: September, 2019• Renewable Energy Projects: Two wind power plant of 25 MW capacity each in Tamilnadu. Estimated project cost: Rs.310cr, Expected Completion: Plant 1: FY 2018-19, Plant 2: FY 2019-20.• Efficiency Improvement Project: HRD- DCW in place of existing settler- washer at stream- 1,2,3 of Alumina Refinery to improve productivity and efficiency. Estimated project cost: Rs. 355 cr, Expected Completion: FY 2020-21. Envisaged Projects:• Establishment 6 lakh TPA brownfield Smelters in Odisha• Establishment 6 lakh TPA greenfield Smelters in Odisha• 1320 MW Thermal power plant at Angul Odisha• Cluster of downstream units of Rolled Products / Foil / Wheel / Extrusion• KABIL (Khanij Bidesh India Limited): JV Company with HCL and MECL to identify, acquire, develop, process and make commercial use of strategic minerals in overseas locations for supply in India.• JV Company with MIDHANI for establishment of high end aluminium alloy manufacturing plant for meeting the requirement of defence, aerospace, automotive and transport sector.• Upstream Integration: CT Pitch plant in JV with NINL in OdishaCorporate Plan:• To face the challenges of ever evolving market and position the Company in a sustainable growth path, a new Corporate plan with a new vision has been developed and rolled out in Jan’18 with well-defined 3 year action plan, 7 year strategy & 15 years vision of being a Premier and Integrated company in the Aluminium value chain with strategic presence in Mining both domestic & global, Metals and Energy sectors. • It provides a roadmap for multi-fold growth in revenue to the sum of Rs.18, 171 cr and Rs.31,248cr by the year 2024 & 2032 respectively.Research & Development:• During FY 2017-18, four (4) patents have been granted in the name of NALCO. Till date, total patent filed are 35 out of which fifteen (15) patent granted and five (5) patent commercialized.• The first of its kind in the world, nano based Emrion technology Defluoridation Plant for treating effluent water of smelter plant and making it potable achieved success at commercial scale. • Waste to wealth creation: Gallium from spent liquor, iron from red mud are some of the frontline projects the company is spearheading in this direction for commercial success. Corporate Social Responsibility: Wealth to WelfareThe CSR Expenditure for the year 2017-18 is Rs. 29 cr against the target of Rs. 27.88 cr.Health Care: 2 full-fledged Hospitals and 8 Mobile Health Units accessible to people of periphery villages benefiting more than one lakh patients every year. Construction of modern Eye Hospital at Angul is in progress.Construction of Night Shelter in AIIMS, Bhubaneswar for attendant of indoor patients and OPD patients availing long term treatment.New Horizons:• Indradhanush:Till date 855 poor & tribal children from Maoist-infested Villages of Koraput sponsored for free residential education in reputed schools. • ‘Beti Bachao, Beti Padhao’:‘NALCO ki Ladli’: Total 277 meritorious girl students of BPL category benefitted till date under the scheme, with financial assistance. Plans underway to take this initiative to Pan-India level.• ODF Village: 2 villages completed in Koraput district. Another 9 villages of Angul and Koraput districts taken up for make it ODF.• Mobile Medical Unit : 5 in Angul & 4 in Damanjodi footfall more than one lakh• PM’s Iconic Shrine Development Programme: – 13 projects have been taken up at Shri Jagannath Temple, Puri & surrounding to upgrade the infrastructure & maintain cleanliness.- Complete LED illumination of the Jagannath temple done. Both side walls of VIP road, Puri beautified with thematic painting based on Jagannath culture. – Renovation and beautification of Gandhi Park taken up to encourage eco-tourism. – Installation of clean water posts at different strategic location of Puri and renovation of museum inside Jagannath Temple is taken up.- Launch of battery-operated vehicle service free of cost for senior citizens, differently-abled passengers and sick people at Puri railway station.• Skill India initiatives of GoI: – 428 local youth have been placed in various job roles by skilling them.- A Centre of Excellence for Skill Development with simulator facility is being established at Bhubaneswar.